The Hickory Crawdads posted five runs in the first inning and made them stand up in a 5-4 win over the Lakewood (NJ) BlueClaws Monday night at L.P. Frans Stadium. The Crawdads (46-27 overall, 2-3 second half) snapped a three-game losing streak, all coming at the hands of Lakewood (36-37, 3-2). Hickory will host a four-game series against the Greenville (S.C.) Drive beginning Tuesday night at 7:00 p.m.
Hickory put seven of the first eight hitters of the game on base against BlueClaws starter Yoel Mecias. Michael De Leon opened the first by doubling into the gap in left-center. Carlos Arroyo then sent a first-pitch fastball well over the fence in right to make it 2-0. The homer was his first stateside shot, having hit two in the Dominican in 2013. 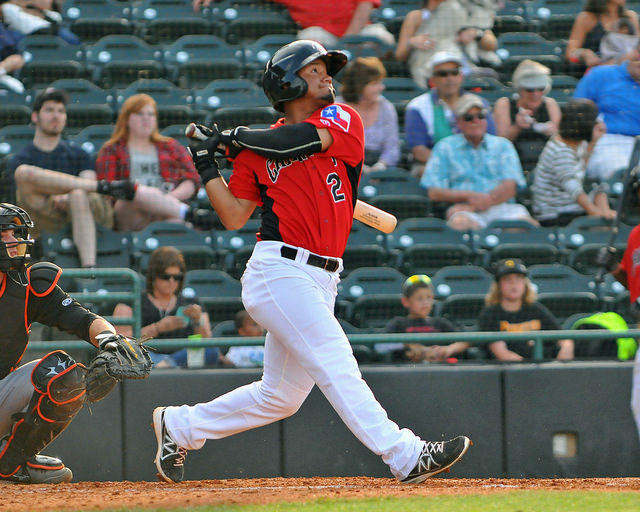 After Eduard Pinto and Jose Trevino walked, Luke Tendler blasted his sixth home run of the season to right, his first since April 30. It turned out that the Crawdads would need all the first-inning runs as Lakewood’s bullpen held Hickory to just two base runners over the final 8.2 innings while its lineup continued to peck away at the lead. After starter Collin Wiles kept the BlueClaws scoreless through two, his own error cost him a run in the third. Gustavo Martinez got Lakewood’s first hit – a soft liner to right – to start the third. An errant pickoff throw by Wiles moved Martinez to second and a pair of grounders to first brought Martinez in to score. In the fourth, Kyle Martin and Damek Tomscha each singled and then one out later moved up a base on a wild pitch. Martin scored on Jiandido Tromp’s grounder to short to make it 5-2. Lakewood chased Wiles with two runs in the sixth. Tomscha and Cord Sandberg each singled with Tromp bringing in Tomscha with a sacrifice fly. Wiles’ second errant pickoff of the game advanced Sandberg to second. Shane McCain entered and then threw a wild pitch to move Sandberg to third before he scored on a groundout by Martinez. Gustavo Marrero followed with a single, but McCain struck out Drew Stankiewicz to quell the threat. McCain worked around a walk in the seventh and turned it over to Erik Swanson to close out the final two innings. The lineup in the first inning: The hitters saw quickly that Mecias had a limited arsenal on the mound. The lefty offered a straight 88-91 mph fastball with an occasional change that missed the plate. The Crawdads were content to stay back for something they could handle and they did picking up four hits and taking three walks. The lone out was a lineout by Beras to the track in center. Michael De Leon: Has begun to crush fastball over the last couple of days. After his double in the first, he laced an Austin Davis heater to straight-away center for a hard out. 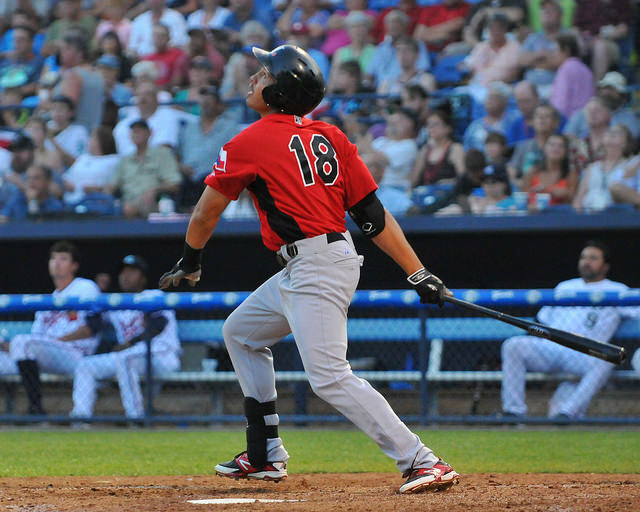 Luke Tendler: Recently said he has had to re-learn to hit the fastball again. His homer to right came on a fastball by Mecias. Now has hits in seven of his last nine games with nine RBI in that stretch. Erik Swanson: Solid two innings to close out the game. Manhandled Tromp with a 95 mph laser to start the 8th and then one out later froze the right-hander Martinez with a 94 on the outside corner. He needed only five pitches to retire the top of the order in the ninth. The final pitch of the night was a change that Kyle Martin dribbled to first. Martin had homered off Swanson two nights before. “He’s up to 95 with an 88-89 mile-an-hour slider,” Ragsdale said. “Was able to throw his changeup over there to the kid that hit the homerun against him the other night and got a rollover to second base. Obviously, the bullpen is why we won the ballgame. Shane McCain: A bit of an Alex Claudio clone, though McCain brings a harder fastball that registered 87-88 and touched 90. Threw a mid-70s, sweeping slider and an upper 60s-low 70s change. Worked out of the inherited jam in the sixth and around a two-out walk in the seventh. Collin Wiles: The righty mixed and matched four pitches and pretty much controlled the strike zone much of the night. Much of the hits against him were grounders that found holes. Slider was especially heavy (broke three bats with it). Wiles was his own worst enemy with the two errors and a wild pitch. Jairo Beras: Benched for the second time this season for not running out a batted ball. This time, it was a fly out that fell just to the foul side of the right field line. With Texas Rangers director of player development Mike Daly in town, as well as field coordinator Casey Ragsdale, it probably was not the best timing for Beras to do this. The offense after the first: Only two hitters reached after the first – Trevino’s single and a bunt single by Arroyo. The Crawdads lineup was anemic against the BlueClaws bullpen, putting only seven hitters on base in 18.1 innings. Austin Davis: Kept Lakewood in the game with 4.1 strong innings. At 6-4, the long-armed lefty threw a tough, lively 92-94 mph crossfire fastball that got to the hitters quickly. Damek Tomscha: Finished the series 8-for-18 with five RBI. Cord Sandberg: Had ten hits in five games with five RBI and five runs scored in the five-game series. The Lakewood BlueClaws took advantage of poor control by Hickory Crawdads starter Cody Buckel to build an early lead and take a 6-3 win Friday night. 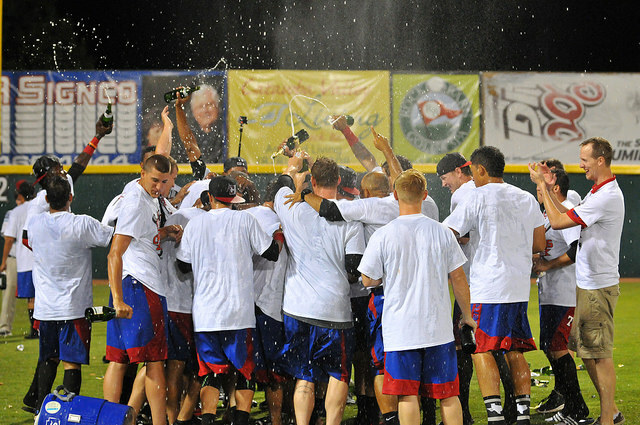 The win by the Blue Claws (34-36 overall, 1-1 second half) evened the five-game series at a game apiece. Hickory (45-25, 1-1) snapped a mini two-game win streak. The teams will resume the series Saturday night at 7:00 p.m. at L.P. Frans Stadium. After the Crawdads dodged a bullet in the first, Lakewood put up a run in the second. Cord Sandberg (3-for-4) singled to right and moved to second on an error by Jairo Beras. A wild pitch by Buckel placed Sandberg at third and he scored when Kyle Martin collected his first pro hit, a double to right. The decisive point of the game came in the third. With one out, Buckel hit Scott Kingery with a pitch and then walked Herlis Rodriguez. After Damek Tomscha was drilled by a pitch, Sandberg lined a first-pitch changeup over the fence in right for a grand slam to make it 5-0. The Crawdads got a run back in the bottom of the third. Ricardo Valencia walked to start the inning. The next batter Jose Cardona hit into a potential 5-4-3 double, but the throw from Derek Campbell at third sailed into right field and put Valencia at third. Michael De Leon’s sacrifice fly scored Valencia to make it 5-1. 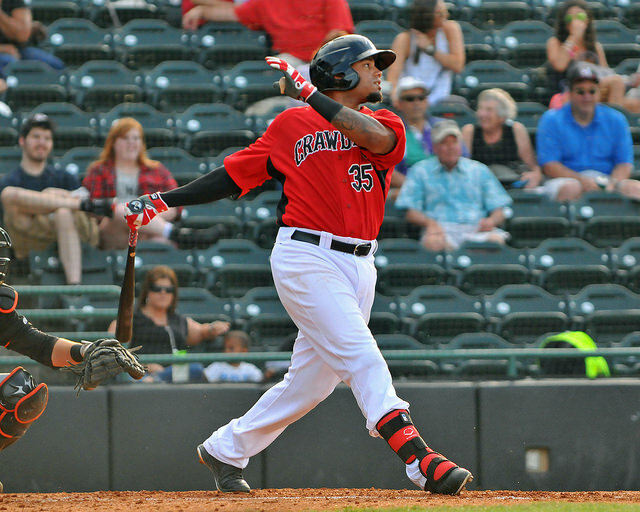 Save for the unearned run in the third, starter Ranfi Casimiro (3-5) held the Crawdads in check until the fifth. He walked Cardona and served up a single to De Leon. A wild pitch moved the runners to second and third. One out later, Beras steered a seeing-eye single into center to make it 5-3. 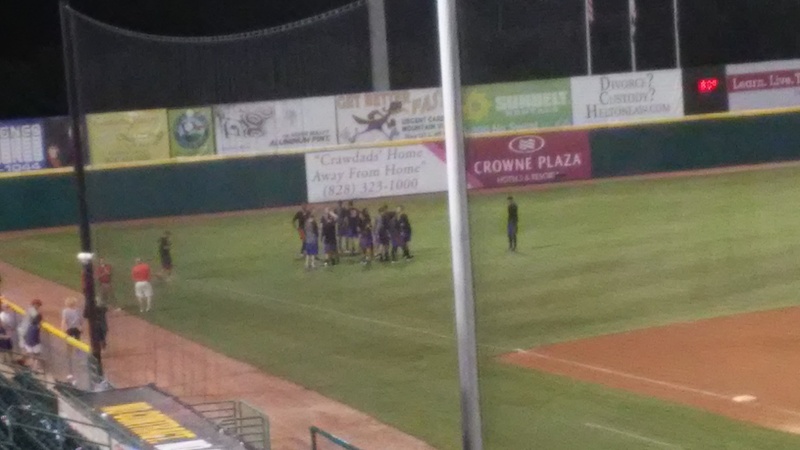 However, that turned out to be final threat by the Crawdads offense in the game. Scott Harris pitched two perfect innings before turning the game over to all-star closer Alexis Rivero. 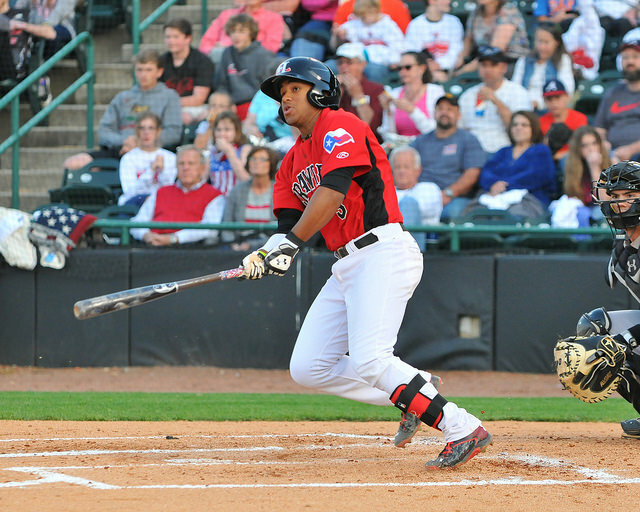 Eduard Pinto was the only Crawdad to reach over the final four innings, as he doubled to start the ninth. He eventually reached third, but was stranded as Rivero struck out Jonathan Meyer to end the game. Lakewood’s final run came when Gustavo Martinez scored on a passed ball in the ninth. 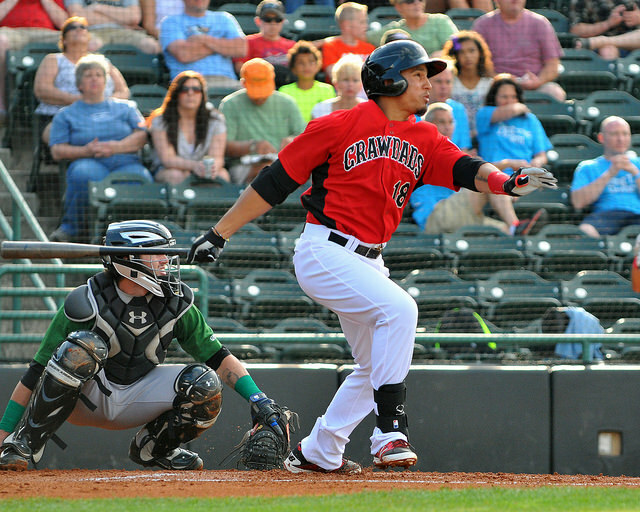 The Defense – Michael De Leon: With a runner at third and one out in the second, the Crawdads brought the infield in. Campbell hit a popup about 25 feet past the cut of the grass. De Leon raced back into the outfield and avoided the on-charging Beras from right to catch the football-like post pattern. The Defense – Jose Cardona: In the sixth made a long run before making an over-the -shoulder catch on the track in straight-away centerfield. Also tracked down a liner in the RCF gap in the seventh. The Defense – Luke Tendler: Kept the BlueClaws off the board in the first with a strong, on-the-money throw to Valencia at home to cut down Drew Stankiewicz on a sac fly attempt by Tomascha. Kelvin Vasquez: Other than an E-5 that allowed Martinez to reach in the fourth, Vasquez held court on the mound. Needed only 11 pitches to complete the final two innings of his 4.1 inning tenure (43 pitches, 30 strikes). Had a little extra giddy-up on the fastball (95-98) than he’d shown in the recent past. Fanned his only two hitters of the night on back-to-back at bats in the fifth. Struck out Tomascha, who whiffed through a 97 mph heater, then got Sandberg to waive at a slider. Jairo Beras: Swung through five breaking balls by Casimiro, but laid off an 0-2 slider in the fifth before getting enough on a changeup to get it through the infield for a two-run single. Josh Morgan: Had the only two-hit game for Hickory, both coming on fastballs by Casimiro. Cody Buckel: Color me concerned. Friday’s outing was painful to watch, as I know how much Buckel has put into getting back to the type of pitcher he was in 2011-2012. There was no fastball command. Of the 41 fastballs (out of 68 total pitches- 27 strikes) he threw (by my count), only16 went for strikes. Six of those were put into play, 3 went for hits, two of those doubles. Usually able to rely on his curveball to get strikes, the smattering of those Buckel threw stayed well up and to the catcher’s glove side. The only missed bats I had were from sliders, which did have some bite. But with the fastball control what it was, there was not much sense chasing. Field staff: With Buckel struggling from the beginning, it seemed that a mound visit would’ve been in order, if for no other reason than to give Buckel a chance to collect himself. Valencia made a few visits, but nothing from the bench. With pitching coach Oscar Marin away for his mid-season sabbatical, his fill-in finally trotted to the mound with the bases loaded in the third. On the next pitch – a flat change – Sandberg took Buckel deep for the decisive slam. Through all this, no one was warming until after the slam. Two batters later, and after his third HBP of the inning, Vasquez was brought in. Buckel threw 31 pitches to get two outs and surrender four runs on five base runners. Ninth-inning defense: The BlueClaws insurance run in the ninth was a matter of “non-error” misplays. 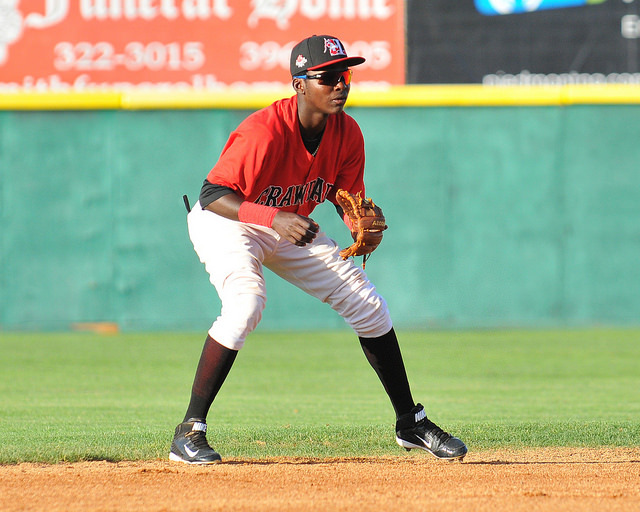 Herlis Rodriguez reached on a bunt when pitcher Shane McCain was slow to cover first. McCain later picked off Rodriguez, but first baseman Rock Shoulders’ throw to second went wide of the bag allowing Rodriguez to steal the bag. Jonathan Meyer’s passed ball (in fairness, he was pressed into service after Valencia’s injury) brought in Rodriguez. The umpires: I’m not usually one to rag on the boys in blue. They are developing and learning just as the players are. Working as a two-man crew brings difficult challenges in making calls, such as making a call at first on the check swing by a left-handed hitter. A horrible call on a checked swing cost Tendler a strikeout in the sixth and the remainder of the game on the subsequent ejection. Perhaps placing the base umpire in the middle of the infield for left-handed hitters will allow them to make better calls. RP Scott Harris: Though the command of it was spotty, he threw a good, hard sinker to record three ground ball outs and K’d Tendler with one in the sixth. Left a trail of tears as three of the six hitters he faced broke their bats. LF Cole Sandberg: Feasted on a couple of fastballs for hits, but picked off a get-me-over changeup for a homer after the Crawdads bench paid a mound visit in the third. Greetings from vacation-land! I’m using the road trip/ all-star break to recharge some batteries and get ready for the second half. 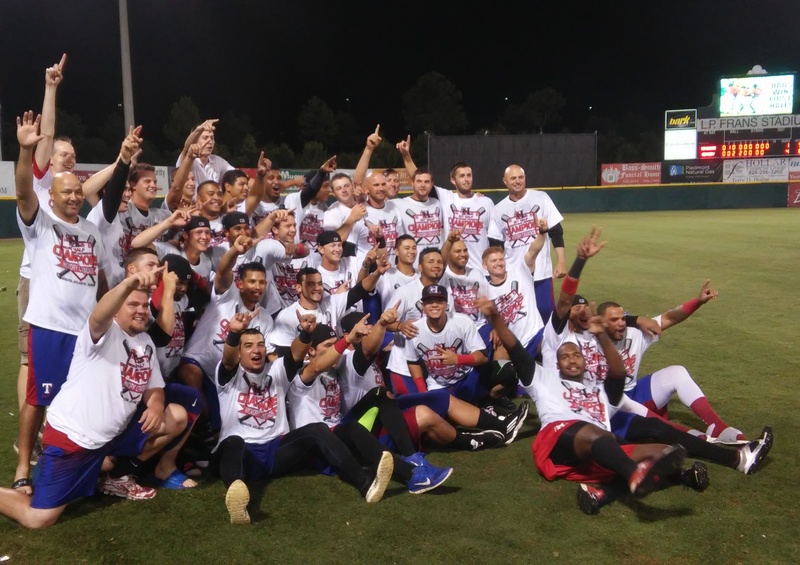 I put together an interview with Texas Rangers minor league hitting coordinator Josue Perez while he was in Hickory during the last homestand. 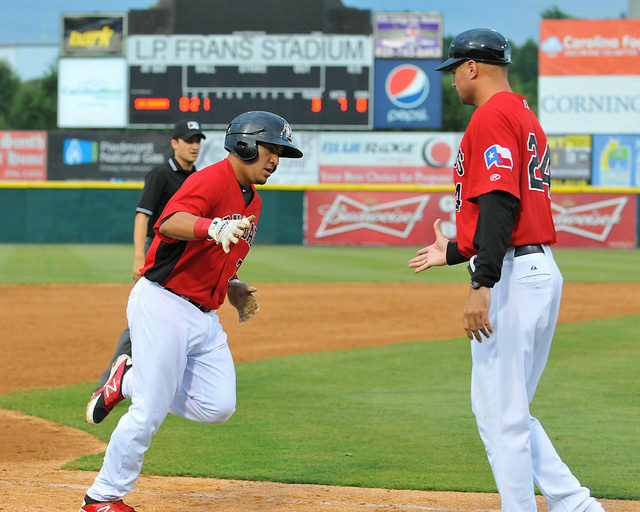 Perez was the Crawdads hitting coach in 2012 and was scheduled to come back to Hickory this season before he took the coordinator’s job. 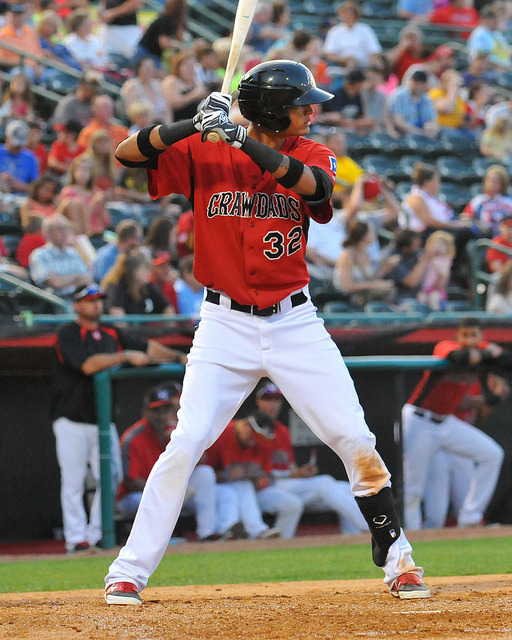 Perez talked about several of the Crawdads hitters (or at least the ones I thought to ask him about) and their progression in the first half. Overall, it’s a good group of hitters. They had a good start; they’ve had some down time. Overall, what have you seen with the group of guys? Perez: Very pleased, I’m very pleased with the group of guys we have here, mostly. Out of the gate, they started out really good. They kind went through a bump in the road there and now we’re trying to get them back together again. I mean, that’s baseball. Overall, I like what I see. We’ll continue to work on staying with a plan and having a plan for the at bats, especially with guys on situational hitting More often than not, they’re able to do it. Early in the year they were doing a great job with situational hitting, where we’d score a lot of runs without getting a big hit. We’d score in a lot of different ways. It’s teaching these kids how to win ball games without necessarily hitting three, four, five home runs in a game. They’re learning from it and they’re getting it, so I’m very pleased. 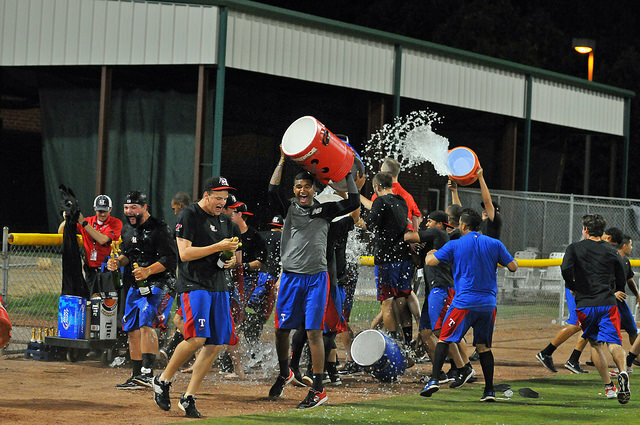 I know Frankie (Crawdads hitting coach Francisco Matos) is very proud of how these guys have gone about their business. Let me ask you first about Luke Tendler. He got off to a good start and had a little bump. What do you see from him? Perez: I think it’s all about going back to basics. Early in the season, he had a plan. He had an approach and he was executing it. Being able to stay on the fastball and be up on everything else. Lately, it’s been the lack of being able to be ready on time. So, he’s missing a lot of fastballs and he’s late getting into position and that’s the reason he’s been struggling a little bit. He’s going back to basics and making sure that he’s still on the fastball when he goes up to bat. You’ve had guys like him and Trevino this year. When you were here in 2012 it was Chris Grayson, who got off to a great start. It seems to be a pattern where a college guy will get off to a good start when no one has really seen them yet, and maybe they’re a bit more advanced because of their age. Then they hit that little lull. Is that a problem that you see when you work with them? Perez: No, I wouldn’t say that; I would say it’s about adjustments. Obviously when facing opposing pitchers, we don’t know a lot about them, just like they don’t know a lot about us. So, at that particular time, the hitters have the advantage. Once the opposing pitchers see the tendencies, they’re going to make an adjustment. And now, you’ve got to make an adjustment back to them. The good ones do make an adjustment and the other ones struggle to get back into it. So it’s still about making adjustments. Are these kids, because for one reason or another they were so successful in college for the most part, or they wouldn’t be here, have they really had to learn how to make adjustments before they got to this level? Perez: I’m pretty sure that a lot of the guys did it, or else they wouldn’t be here. That’s just the nature of competing. If you want to win the at bat, or you want to win the game, you have to make an adjustment from game to game. But here it’s a little bit different, because it’s not game by game, it’s at bat to at bat. Sometimes, it’s pitch to pitch. The ones that are able to do that are the better ones. I think somewhere along the way, they have to make that adjustment. Here it’s more magnified because the pitchers are better. They have better stuff and they’re able to express it a little bit better. Let me ask you about (Jose) Trevino, who is another one that got off to a good start and seems to be finding his way again. Perez: You have to take into consideration with Trevino that he is behind the dish for the first time in a full season. He’s been catching a lot of games. He’s a kid that plays with a lot of energy and a lot of life. He’s really into every pitch behind the dish and he’s the same way as a hitter. So, a lot of times we ask those guys to be a catcher first and then a hitter. We’re trying to combine both of them and I think he’s one of the good ones that’s going to be able to do it – both catch and hit. Again he’s hitting the ball on the rope, like you said, and he had a big three-run bomb a couple of days ago. He’s starting to feel that early feeling back again. Again, it’s just a matter of – and we talk about this all the time – it’s not how you start, but how you finish. Along the way you’re going to find some ways to fight. If you fight the right way, you’re going to stay above water. So, he’s doing a good job of it. Josh Morgan is in a nice stretch over about a 35-game stretch. He was one that started slow and come on as the season progressed. What do you see with Josh? Perez: The word with Josh is he’s basically rolling right along. He was a little bit off when we first started the season. To his credit, and Frankie’s credit, he’s worked hard every day on trying to get him back to the way we saw him in spring training. Getting him into position to hit, making sure he’s staying on the fastball, making sure he stays on his front, not trying to do too much, stay away from the air, backspin the ball. So, little by little, he’s started to not only believe it, but execute it. And now he’s executing it more often than not. He’s starting to back spin the ball, taking good pitches and getting into good counts, driving the ball. So, he’s been able to maintain it for a long period of time, which is pretty remarkable at his age, to see it. I hope he’s able to keep it the right way, now. Jairo Beras, I know has had a disappointing start – especially given where he ended up last year – with injuries and other things that have happened. What’s the plan for him at this point? Perez: It’s about now. It’s about being where his feet are. It’s about winning the moment. It’s about the rest of the year. We’re not talking about the past. That’s over. Can we win every day from now on? That’s basically the message to him. Forget about it and let’s start over. This is a new beginning. Every day, come to the ballpark ready to play. Help this team win, which is in a really good place right now. They’re playing for something. Not only are they playing because they want to be big leaguers and reach the majors, but they’re playing to win it. It’s always fun when you’re in that kind of environment. We want him to be a part of it and he wants to be a part of it. This is about the moment. Be a good teammate everyday and do whatever you can now to win this moment. That’s the plan. It’s been pretty good since being back, both offensively and defensively. The motivation’s been good and he wants to play. Deep inside, he wants to reach his dream and that’s always going to be the biggest motivation. Now, he’s got the baby, so that’s a big motivation that he’s playing for. Again, it’s about how he can win the moment from now on. Rock Shoulders is a guy who came here with some experience. He’s got here and basically hit into some bad luck. He’ll hit the ball on the screws and it’s finding people. What do you expect to see from him? Perez: I saw him in Round Rock. He was there for about a week or so, because we needed some bodies there. He did a really good job there. 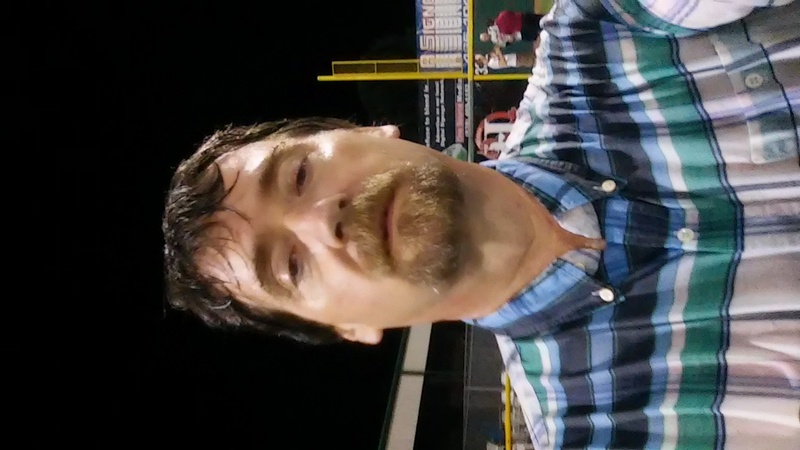 We actually won a game 1-0 in Round Rock and he hit a solo home run. Then he took a couple of other good swings and had another really good game there. So, I came down here saw that he was struggling without struggling kind of deal, where he’d hit a few balls well, he had no luck. The next thing you know, he went a few days without a hit. That’s just baseball. A lot of times, you do a lot of good things and things don’t go your way. Again, he’s in a position right now where he’s going to be able to help this team. Right now, some of the luck is starting to go his way and he’s starting to put some good at bats together. He’s starting to swing the bat and I know he had some good power numbers with the Cubs. So hopefully we can see that some of that in this organization and try to help his career. (Eduard) Pinto had a good winter and starting well and like most everybody else tailed off. He just looks like a hit machine. When he’s in a groove, you’re not going to get it by him. He’s also starting to show a little patience lately. Perez: He’s a professional hitter. And now like you said, now he’s adding that patience at the plate and is able to stay with his plan and stay with his pitch and not go away from what he wants to do at the plate. He’s going to going to become a little bit more of a professional hitter. He has a really good feel for hitting and a really good barrel awareness. He knows how to use the whole field. He’s fun to watch and he brings a lot of energy and he’s only 20. He reminds me – and I don’t know why and whether or not this is an accurate comparison – he reminds me of Tomas Telis for whatever reason. He has that stocky body at the plate and quick hands and a good eye. Perez: Yes, especially from the left side, it’s a little bit of Telis. Telis probably swings a little bit harder than Pinto does, but it’s pretty much the same guy. He’s scrappy, knows how to barrel the ball, goes the other way, and pulls it when he has to. He goes up there to hit. He’s a good hitter and hopefully we can get him up in the system so we can do something good for him. Who else do you need to talk about? Perez: (Michael) De Leon and the heart and soul he brings to the team. Obviously, we know that the hitting is always going to be light right now until he grows into his body a little bit more. A lot of stuff that doesn’t show up in the box score, he does it. That’s why I bring him up. I think he’s the heart and soul of this team. I love some other guys, obviously, but what he brings to the game – the energy, he’s always happy the plays that he makes, he quarterbacks the whole field from the shortstop position, and how much this team trusts him – is pretty remarkable at his age. I had the pleasure to watch him last year in the playoffs at the end of the year at Myrtle (Beach). He came up in clutch situations and got big hits in the playoff, including a three-run bomb in the championship series. So I know what type of player he is in big moments. He’s not afraid of big moments. Perez: He’s not, and actually he looks for them. That’s what you want.